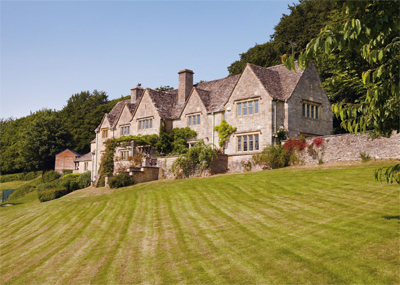 Workham Farm is a classic country property with very fine views just over four miles from Burford in Oxfordshire. Originally built in the 1930s, the property has been extended a number of times, and provides very good family accommodation over two floors. Period features include open fireplaces and mullion windows, while the principal reception rooms are suitable for entertaining; the sitting room, dining room and drawing room all have fireplaces, and the dining room and games room benefit from French windows opening onto the terrace. Accommodation comprises: on the ground floor the reception hall, drawing room, dining room, sitting room, two studies, games room, kitchen/breakfast room, two cloakrooms and cellar on the lower ground floor. The first floor houses the master bedroom suite and four further bedrooms, plus a family bathrooms and family shower room, as well as two rooms above the games room which have potential for a self-contained flat. Outside the rear entrance is a boot room, dog room and log store. The swimming pool lies to the west of the house. Stable Cottage offers two reception rooms, two bedrooms and a kitchen. The gardens and grounds include both sides of a pretty valley with a lake and stream equestrian buyers will be pleased with the feed room, tack room, stables, horse walker, outdoor school and watered paddocks. Some woodland makes up the rest of the land, which amounts to around 25 acres. Workham Farm occupies an elevated position just over half a mile west of Fifield in Oxfordshire, and over four miles from Burford. Chipping Norton is just nine miles. The guide price is £2.8m. For further information please contact Savills on 020 7016 3780 or visit www.savills.co.uk.